Phelsuma standingi is among the largest extant species of day geckos. The body colour can be quite variable, depending on light intensity. It can be brownish grey or bright green or turquoise with grey to blue reticulated markings on its body and head. Their head is usually a yellowish green and their tail is usually turquoise. Hatchlings have a yellowish green head and typical light bands and bars on their backs. In the males cloacal area has very pronounced preanal pores than the females and a bulge in the area of hemipenis. 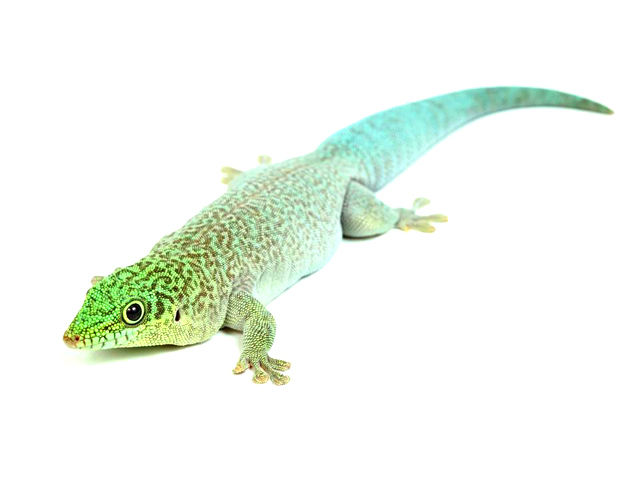 For a sexed adult pair of Phelsuma standingi a vivarium size of 0.6 x 0.6 x 0.6 meters ( 2 x 2 x 2 feet) is recommended as a minimum. This gives the pair space to be away from each other if and when they need it. Anything smaller and they may become stressed with each other and will become aggressive towards one another. It is also worth noting that multiple adult males and females can and will show aggression towards each other in territorial disputes, so a sexed pair per enclosure is recommended. Hollow bamboo tubes large enough for the animals to fit into make great hides for this species. They will also lay their eggs in these tubes where the eggs can be left to incubate with the parents and the hatchlings can also be left with their parents. A mix of dry soil (eco earth, top soil etc) orchid bark and possibly a small amount of sand works well for these guys. UVB 10-12% is a must for this species. They are diurnal by nature which means their most active hours are throughout the day. It’s always recommended to emulate the day/night cycles according to the time of the year. A basking light set to approximately 32-35 °C (89-95 °F) should be offered to this species. You can achieve this with a 50w halogen heat bulb or something similar. An ambient temperature of 25-29°C (77-84 °F) throughout the day with a night drop to around 22 °C (71 °F) is ample for this species. A daily misting of the enclosure will give this species plenty to drink, They will lap up droplets of water from the glass and décor. Phelsuma standingi inhabit dry forests of South Western Madagascar. So an average humidity of 50-60% will be ample. You can achieve this with a light daily misting of their vivarium with clean fresh water (preferably bottled or dechlorinated water). The use of live plants within the vivarium can also help to keep humidity. Yuccas, dracaenas and sansevierias are all good choices for this species. Half a dozen large banded or brown crickets every two-three days per animal is sufficient. They will also eat large wax moths as offered as treat every now and then. Once a week I also give my pair a mixture of Rephashy phelsuma diet (or similar brand) and fresh mango, papaya and banana blended into a thick smoothie like substance. This can either be offered in a bowl or it can be spread onto leaves, branches etc. around the vivarium to offer some behavioural enrichment. Most, if not all, Phelsuma do appreciate being held. You may get to a stage of complacent behaviour with the animals where they will take food from your hands or tongs and eventually may come onto to your hands. In my opinion this form of interaction with the animal is more rewarding as the animal is showing trust towards you in the same way that a wild animal may show trust towards you if you encounter them. These animals can also be very territorial towards humans and will actually bite you if they feel you are being too invasive. They will also exhibit this aggressive behaviour towards humans if there are eggs/young present in the enclosure. All Phelsuma seem to have a fondness of defecating on the glass doors of their enclosure, so glass cleaning is a regular occurrence with the whole genus. Use either warm water with a small amount of soap in it to clean the glass or water with a bit of lemon juice works well to remove excrement and water marks from the glass. As they very rarely spend any time on the floor substrate changing isnt required all that often. You could also add small custodial insect (woodlice, springtails, dermestid beetles, mealworms etc) to aid with the cleaning of the substrate. If humidity requirements are met then there should be no issues with shedding old skin. They will also eat their shed skin so as not to lose any nutrients. Phelsuma are generally shy and skitty animals, so stress is the most common problem with them. 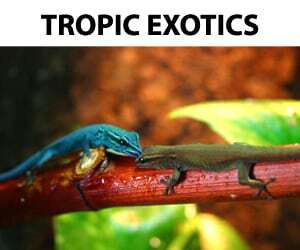 A stressed Phelsuma will exhibit dull colouration and heavy breathing. As long they have plenty of space to hide away from each other and from your view then this should not be an issue. They can also show aggression towards each other and can cause quite a lot of damage, this usually indicates that there is not enough food and space for the pair. Increasing vivarium size and offering more food and hides should solve this problem.